HELMER: [Threatening with his finger.] Hasn't the little sweet-tooth been playing pranks to-day? NORA: No; how can you think such a thing! HELMER: Didn't she just look in at the confectioner's? HELMER: Not to sip a little jelly? HELMER: Hasn't she even nibbled a macaroon or two? NORA: No, Torvald, indeed, indeed! HELMER: Well, well, well; of course I'm only joking. NORA: [Goes to the table on the right.] I shouldn't think of doing what you disapprove of. As many women have been expected to do throughout Korean history, the protagonist in this play, Nora, is a woman who follows her husband’s command in every way. During the play, Nora is forced by social convention to live through her marriage to Helmer without resistance. However, she had a secret; when Helmer got a serious illness, she illegally borrowed money from Krogstad, a man who works in Helmer’s bank. It was not a behavior that can be accepted to Helmer, so Nora kept it as a secret. However, Krogstad comes and threats Nora saying that he will reveal the secret unless she helps him not to be fired. Nora does everything to conceal the secret. 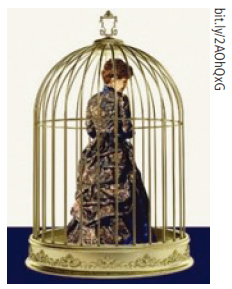 Like much European literature of the 19th century, A Doll’s House examines marriage as a social institution that many men and women enter unwillingly, whether through family pressure, economic pressure, by matchmaking, or by prior arrangement. These works of literature present marriages that end tragically for everyone involved. In Ibsen’s play, Nora, a dutiful wife, tries to look after her husband, Helmer, who becomes seriously ill. To pay for Helmer’s treatment, Nora borrows illegally from one of Helmer’s employees. Since Helmer would not have accepted this decision, Nora keeps it a secret, and this ethical conflict, combined with other failures in their relationship, eventually leads to the end of the marriage. Until quite recently in Korea, marriages were mainly formed through matchmaking, which was a socially accepted idea. Society has not encouraged freedom in choosing partners. Nowadays, however, people usually marry after dating freely. Of course, the interpretation of the word “freely” varies somewhat from person to person, but today, people have more options to consider as they approach marriage. Amid these changes, the value of marriage is in transition. It is much easier to find differences of opinion about marriage compared to the past. Therefore, in this article, The UOS Times presents a survey of attitudes held by students at the University of Seoul (UOS) toward marriage. How Many UOS Students Want Marriage? To gain some insight into student attitudes toward marriage, The UOS Times conducted a survey and organized the data according to gender, university year, and major. 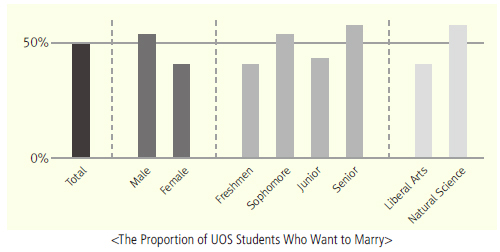 Among those surveyed, 49 percent of UOS students said they would choose to marry. According to gender, more male students want to marry than female students. 56 percent of male students and 41 percent of female students answered that they want to marry. By university year, the results were disproportionate: 41 percent of freshmen, 56 percent of sophomores, 44 percent of juniors, and 59 percent of seniors said that they would like to marry. The percentage of second-year students who wished to marry was sharply higher than that of first and third-year students. However, the proportion increased again in among fourth-year students. By major, compared to students majoring in liberal arts, more students who are majoring in natural sciences selected the option of marrying - 43 percent compared to 58 percent. Although Ahn’s doubts are similar to those of many students, there are significant differences in the numbers of men and women citing each reason. Among male students, for example, 30 percent said they were concerned about loss of personal freedom while 23 percent said they were worried about having problems with their spouses. Only a few - six percent - said they worried about career problems, and only five percent cited pressure to do housework. Female students, however, more generally cited all of these worries. Forty percent responded that they were worried about losing personal freedom, and 30 percent cited the pressures of doing housework. This indicates that female students feel more pressure in household chores and raising children than male students do. The results of this survey of UOS students parallels trends in Korean society overall. In fact, many articles and studies in recent years have shown that women spend more time and energy on household chores than men in most families. 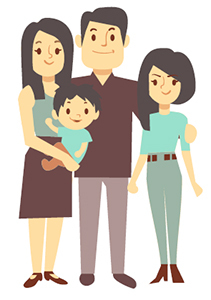 Since Korea has traditionally been a patriarchal society, fathers have usually earned the income, while mothers have managed households for their families. These roles are still prevalent stereotypes, with many people believing that it is a reasonable distribution of roles. However, as women’s social engagement has increased, they have found employment to provide for their own living. Here, a problem arises: even though mothers have their own employment, many people still think housework is the exclusive domain of women; this belief remains widespread throughout Korean society. According to Statistics Korea, the average time that men spend doing housework is the lowest among 26 countries. In contrast, women on average spend five times more time on housework than men do. The prospect of spending so much time on housework may lead female students to feel that marriage will deprive them of freedom. Students who are majoring in natural science are more confident about marriage than liberal arts students. While 58 percent of natural science students answered that they want to marry, only 43 percent of liberal arts students chose the option of marrying on the survey. That is a 15 percent discrepancy between the two, and The UOS Times attributes this gap to differences in gender ratio - the higher number of male students compared to female students attending the university. This gender ratio imbalance is seen in both natural science and liberal arts, but the degree of imbalance is much more excessive in natural science. On the survey, natural science students chose the option of marrying because that department has relatively fewer females than liberal arts does, and female students usually face more changes in marriage. A thesis written by Kim Mi-yae and Song Young-suk in 2012 supports this conclusion. Since having children is a more important factor to consider for female than for male students when they choose jobs or make future plans, most female students do not regard marriage as positive. Also, the thesis says female students feel that it will be more burdensome to spend time, money, and energy raising children. Although the results were analyzed according to major, the difference in results is due primarily to a difference in gender ratio between the two majors. Home environment and childhood background strongly affect the value a person places on marriage. According to a thesis written in 2015, a person’s outlook on marriage becomes positive when mothers perform traditional roles, and when parents avoid open conflict and exercise moderate authority in raising their children. Students’ comments on the survey reflected this: “I have received a lot of love from my mother, and even now, I am really happy in the moments when I feel loved. Like my parents did for me, I want to do the same for my children. Making a harmonious family is one of my dreams, ” said an anonymous student. Among the options, one perhaps deserves more attention as the one chosen by fewest respondents: “because it is a socially accepted idea.” This answer marks a break with conventions of the past. In our parents’ and grandparents’ generation, marriage was not a thing that one could choose; rather, the predominant view was that marriage was one of the essential processes of one’s life. The way that people chose spouses was also much different from now. As evidence of how this view has changed over the decades, we can consider an article published in The Dong-A Ilbo newspaper on April 30, 1975, which dealt with dating trends among university students. According to the article, until 1965, the spouses of young generations were first introduced by their parents. However, by 1975, the convention had become much more liberal. People selected spouses based on their own decisions. Parents, whose role had become only to permit their children’s marriage, rarely interrupted the process of choosing a spouse. Regarding the “desire to have children,” there is relatively larger difference in proportion between males and females than for the other options. Whereas 35 percent of male students answered that they wanted to marry in order to have children, only 19 percent of female students chose this option. This result also serves as a counterpoint to one of the reasons that students are choosing not to marry, namely “because nurturing children is burdensome.” Only 23 percent of male students chose that option, compared with 39 percent of female students, which is a much larger proportion than male. Since female students feel it is more burdensome to nurture children, they are more likely to give up having children for their own pleasure. 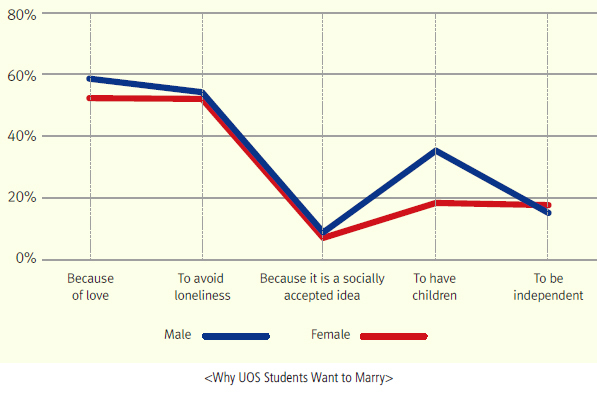 There is yet another interesting parallel between how UOS students responded to these survey questions, and how Korean society in general views marriage. When we categorize the results of this survey by year in university, we find that fourth-year students have the most favorable views of marriage. This favorability has long been observed among older university students. In a thesis written in 2012, researchers Kim Mi-ye and Song Young-sook, also observed that older students feel more positive toward marriage values. In another thesis that used data from Statistics Korea, 92 percent of people who are in their sixties or older agreed with the idea of marriage, whereas only 65 to 67 percent of people in their twenties and thirties agreed. This overall tendency is also displayed in statistics derived from this UOS survey. When UOS students were asked how many children they want to have, the number on average was 1.51. Something to notice here is that fourth grade students tend to want the fewest children, 1.41. According to a study by Han Nu-ri and Moon Hyuk-joon in 2015, this is because as students grow older, they tend to place more emphasis on stability in marriage institutions and conditions. Since raising children requires significant time and money, it is not easy for people living in the contemporary era to decide whether to have children. According to an article at the online news site MoneyToday, it takes about 270,000 USD to 360,000 USD to raise one child until he or she graduates from university. Understandingly, 44.3 percent of research participants answered that they want to give up childbirth because of the difficulty of meeting childrearing expenses, according to a report written in 2014 by the Korea Economic Research Institute. Although people find happiness with their children, they face reality as they feel difficulty in many ways, including economical problem, as they get older. Fourth-year students’ answers seem to reflect the reality of Korean society. According to gender, results for the question “At what age do you hope to get married?,” male students answered that they hope to marry at 31.1 years of age, and female students, 30.3 years on average. This figure is similar to Korea’s actual average age for first marriage. According to Statistics Korea, between 2012 and 2016, the average age for first marriage was 32.4 years for males and 29.8 years for females. However, these statistics show a marked big difference compared to the figures derived for the period between 1992 and 1996, which was 28.2 years for males, and 25.1 years for females- a difference of four years, meaningful because the time that people first attempt marriage age in Korea is affected by many social issues. Professor Jeon Joo-ram summed up these issues, and the challenges that young people face when considering marriage. “First, the political and economic problems caused by the social system create tough situations for the youth. The unemployment crisis seems to be the main reason for delaying marriage,” Jeon said. “Secondly, the values of family, marriage, relationships, and childbirth have changed. As Korea’s average age increases, it is less common to hear babies crying in Seoul. Because a new concept of family values has recently emerged, it seems that young people consider marriage to be just an option, not a necessary process. It is not hard to find young people who are living with their boyfriends, girlfriends, or just with people who have the same hobbies,” Jeon said. Jeon’s comments seem to reflect the thoughts of UOS students’ thoughts accurately. Society requires relatively higher qualifications than in the past when people try to find employment. In the process of meeting these requirements, many people inevitably postpone marriage. On average, 54 percent of students surveyed stated that they chose their desired age of marriage because- in the wording of the survey - it is an age of economic independence.” Thus, we see that economic conditions have a profound effect on students’ decisions about marriage. 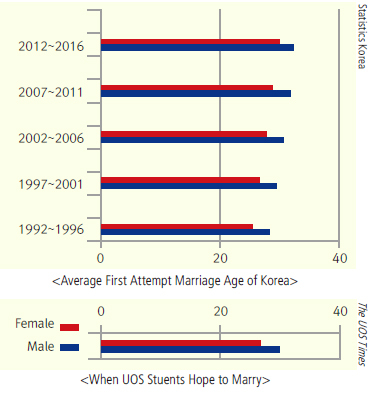 Although our investigation only explores the attitudes of UOS students, these results may provide clues to future of marriage trends in Korea. Perhaps the Ibsen play, A Doll’s House, also provides some insight into why attitudes toward marriage are always changing. By the end of the play, Helmer finally realized what Nora had done, and he accused her of ruining all of his happiness. He raged, but when he received a notice that all debts had been paid, and realized there would be no further problem, he tried to act as if nothing had happened; he tried to carry on with marriage as he always had. However, his cruel and selfish words triggered something in Nora, a resentment that had taken years to build. In the end, she left the house. HELMER: Nora- can I never be more than a stranger to you? HELMER: What is the miracle of miracles? NORA: Both of us would have to change so that- Oh, Torvald, I no longer believe in miracles. HELMER: But I will believe. Tell me! We must so change that-? It was a shocking end for people living in that era because it was a social convention to live like Nora had lived at the beginning of the play. Some people saw Nora as a symbol of women's liberation, but most people thought that Nora's married life had been destroyed. Now, however, the definition of marriage which we consider to be natural is not the same of as in the past. We are living in a period of transition. Therefore, there is no exact guideline for handling this newly generated form of love and marriage, a form that perhaps cannot be found in history. Therefore, like older people who married because it was a social custom, will it be wise to just follow the old biases toward marriage? We have no answer because ideologies and conventions change throughout time. Like Nora, how about deciding your marriage or date not by others but with your personal value? * Kim Mi-yae, Song Yeoung-suk, 「University Students' Values on Marriage, Gender Role, and Children」, 『The Korean Academic Society of Nursing Education』, August 2012. * Han Nu-ri, Moon Hyuk-jun, 「The Effects of University Students' Identity and Parent's Marital Relationship on their Perceptions of Marriage」, 『Korean Journal of Human Ecology』, 24(2), April 2015.